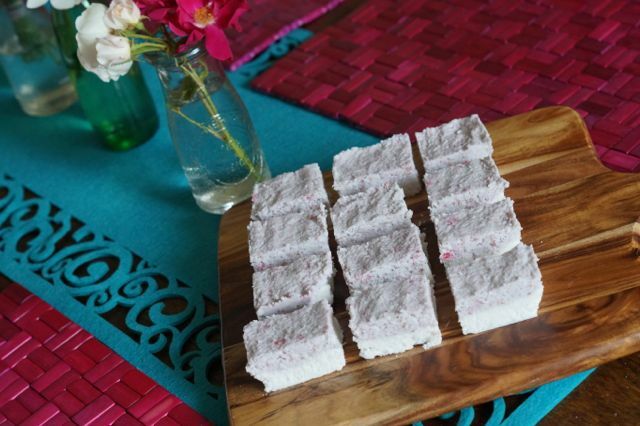 Paleo Coconut Ice Recipe | Paleo Christmas Sweet Treats. Fact: paleo coconut ice is delicious! We must admit when we first made this recipe we didn’t have high expectations. Traditional recipes are full of stuff like sugar, condensed milk and colourings (so not very paleo at all!). We are happy to announce our paleo coconut ice tastes amazing without all of these icky ingredients, you feel amazing after and it’s a pretty darn healthy sweet treat! It really is just coconutty goodness. YUM. For Christmas this year we’ve decided to give the gift of delish paleo sweet treats to all our friends + family. We will be wrapping these pink and white mouthfuls in cellophane and tying with cute ribbon. What more could anyone want?! Check out some of our other Christmas sweet treat recipes: paleo raw Christmas cake recipe and paleo raw mango pudding. So much healthy deliciousness. Line the base of a 15 x 25cm slice tin. In a saucepan over low heat place the coconut oil, coconut milk, vanilla + natvia. Stir until melted + combined. Remove from heat + combine with desiccated coconut in a separate bowl. Press half the mixture into the prepared tin + place into the freezer. Leave in the freezer until just firm. Meanwhile, in a food processor (we use our Vitamix) whiz the raspberries until smooth. Combine the raspberries with the remaining coconut mixture. It should be pink! Take the tin out of the freezer + press the pink mixture on top of the white. Place back into the freezer until firm (about 30 minutes). Cut into slices + enjoy! Store the slice in an air tight container in the fridge for up to 5 days.